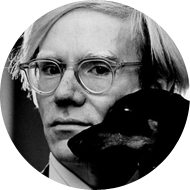 Warhol's art encompassed many forms of media, including hand drawing, painting, printmaking, photography, silk screening, sculpture, film, and music. He was also a pioneer in computer-generated art using Amiga computers that were introduced in 1984, two years before his death. He founded Interview Magazine and was the author of numerous books, including The Philosophy of Andy Warhol and Popism: The Warhol Sixties. He managed and produced the Velvet Underground, a rock band which had a strong influence on the evolution of punk rock music. He is also notable as a gay man who lived openly as such before the gay liberation movement. His studio, The Factory, was a famous gathering place that brought together distinguished intellectuals, drag queens, playwrights, Bohemian street people, Hollywood celebrities, and wealthy patrons.